Discussion in 'THE ARCH' started by Aoi Kurenai, Aug 27, 2011. Welcome to Kamen Rider Fourze, the 22nd Kamen Rider series and first to be written by Kazuki Nakashima and directed by Koichi Sakamoto with the return of Double's head producer Hideaki Tsukada. The setting this time is Milky Way High School where the new kid is Gentaro Kisaragi, someone aiming to be friends with the entire school! But will the strange Kengo Utahoshi, who declares Gentaro has no chance of being friends with him get in the way of his goals or is it the beginning of a slightly terrifying friendship? Also, some guys in suits fight each other or something. This was a pretty amusing first episode, definitely has the sort of main character we haven't seen too much of at all. Really going to like watching Gentaro over the year, and the setting in general just seems awesome. Kengo's a pretty interesting character with a sad back story, seems like he never knew his father? And he's too weak to really be much of a help in the fights for too long, which I bet will probably end up being some big story point later on. And damn that opening for making me think they were all a big gang of friends from the first episode on. Woot! An epic start~! I think I'm going to be liking this season a lot more than I originally thought! I can see Gentaro becoming one of my favorite characters in the future. I liked the opening but I kinda hated the beginning part.Engrish isn't my thing. I thought this was great fun! Gentaro might just turn out to be one of my favourite Riders in a long time (and the competition from W and OOO is very high.) The first henshin sequence looked groovy and I love the theme song too, although the Engrish is pretty annoying. I think I'm going to like this show. Right from the start it's not taking the high school setting seriously at all. Characters skip class, do things that should get them expelled, and then they go and trash the place. Excellent. 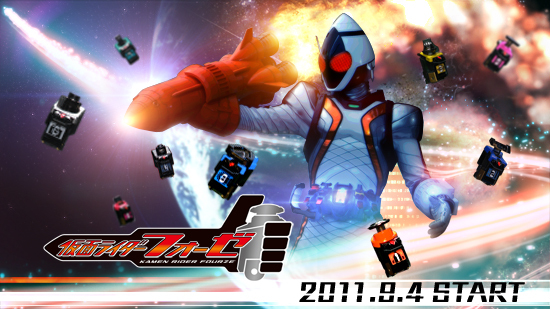 Gentaro's great. I'll have more to say when I can watch it again. "If Kamen Rider did a Sentai type opening this is what it would look like"
I don't think this opening will grow on me.